Strong updrafts create a rain-free "vault" underneath the leading edge of a supercell. Hail is precipitation that is formed when updrafts in thunderstorms carry raindrops upward into extremely cold areas of the atmosphere. Hail can damage aircraft, homes and cars, and can be deadly to livestock and people. One of the people killed during the March 28, 2000 tornado in Fort Worth was killed when struck by grapefruit-size hail. While Florida has the most thunderstorms, New Mexico, Colorado, and Wyoming usually have the most hail storms. Why? The freezing level in the Florida thunderstorms is so high, the hail often melts before reaching the ground. Hailstones grow by collision with supercooled water drops. (Supercooled drops are liquid drops surrounded by air that is below freezing which is a common occurrence in thunderstorms.) There are two methods by which the hailstone grows, wet growth and dry growth, and which produce the "layered look" of hail. In wet growth, the hailstone nucleus (a tiny piece of ice) is in a region where the air temperature is below freezing, but not super cold. Upon colliding with a supercooled drop the water does not immediately freeze around the nucleus. Same cross-section as before but showing an idealized path of hail within cloud. Instead liquid water spreads across tumbling hailstones and slowly freezes. Since the process is slow, air bubbles can escape resulting in a layer of clear ice. With dry growth, the air temperature is well below freezing and the water droplet immediately freezes as it collides with the nucleus. The air bubbles are "frozen" in place, leaving cloudy ice. 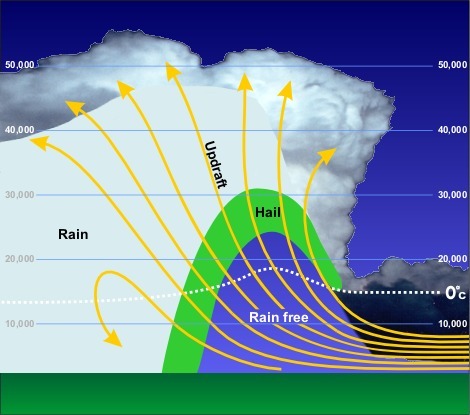 Strong updrafts create a rain-free area in supercell thunderstorms. Meteorologists call this area a WER which stands for "weak echo region". This term, WER, comes from an apparently rain free region of a thunderstorm which is bounded on one side AND above by very intense precipitation indicted by a strong echo on radar. The hail nucleus, buoyed by the updraft is carried aloft by the updraft and begins to grow in size as it collides with supercooled raindrops and other small pieces of hail. Sometimes the hailstone is blown out of the main updraft and begins to fall to the earth. If the updraft is strong enough it will move the hailstone back into the cloud where it once again collides with water and hail and grows. This process may be repeated several times. In all cases, when the hailstone can no longer be supported by the updraft it falls to the earth. The stronger the updraft, the larger the hailstones that can be produced by the thunderstorm. Multi-cell thunderstorms produce many hail storms but usually not the largest hailstones. The reason is that the mature stage in the life cycle of the multi-cell is relatively short which decreases the time for growth. However, the sustained updraft in supercell thunderstorms support large hail formation by repeatedly lifting the hailstones into the very cold air at the top of the thunderstorm cloud. The stronger the updraft the larger the hailstone can grow. In all cases, the hail falls when the thunderstorm's updraft can no longer support the weight of the ice. How strong does the updraft need to be for the various sizes of hail? The table (right)(above) provides the approximate speed for each size.